This Tuscan red, from Carmignano just west of Florence, is far removed from boring entry-level Chiantis. Mostly Sangiovese (75%), with 20% Cabernet and 5% Cainolo, it’s bursting with rich cherries, plums, and just a touch of oak. 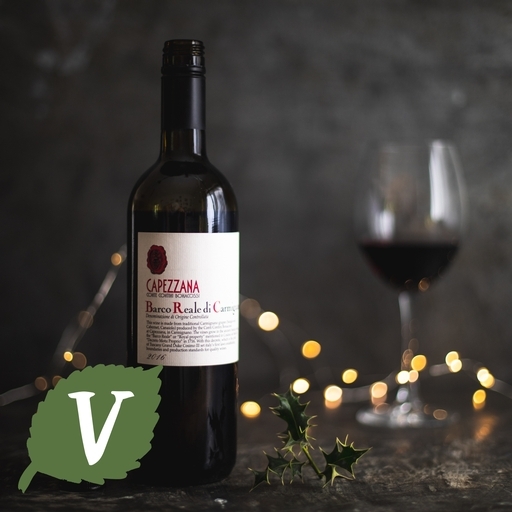 Rounded and ripe on the palate, with lovely balanced tannins – and you’ll savour a hint of spiced berry on the long, elegant finish. The Capezzana estate, 24 kilometres north west of Florence, is owned by the Contini Bonacossi family. The younger generation is now firmly in charge of the estate’s 100 hectares of vineyard, with daughter Benedetta Contini Bonacossi as winemaker and Francesco Bernabei as consultant winemaker. The Capezzana heritage goes back much further, with vines producing wine on this land for over 1200 years. Their predominant grape variety is of course Sangiovese, produced on south-facing hillside vineyards which are certified organic.